If Sandy could sing a song to his idol Josh Groban, what would he pick? Read on to find out! 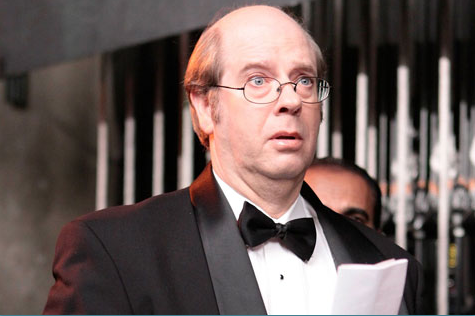 Stephen Tobolowsky has been in everything. Okay, almost everything. Just the other day on Twitter when a fan remarked that she kept seeing him in every movie that came on TV and asked where Stephen didn’t have a role, the comedic star simply replied: “I was not in Sister Act 2.” Over the course of his Hollywood career, however, Stephen has racked up over 200 film and television credits, including such well-defined characters as Ned Ryerson in Groundhog Day, to Sammy Jankins in Memento, to, of course, Sandy Ryerson in Glee. The gracious star (who frequently chats with fans on Twitter) took the time to answer a few questions via e-mail about Sandy, his fellow Glee cast members, and more. Part of our Q&A is below, but if you want to read my entire interview with Stephen (in which he also discusses what guest stars he’d like to see on Glee and what’s it like to work with such a large ensemble cast), you’re going to have to wait until September! 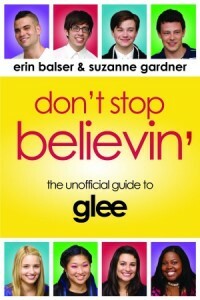 The full interview will be published in my upcoming companion guide book Don’t Stop Believin’: The Unofficial Guide to Glee which will be in stores this fall. Gleeks United: Tell us more about how you see the character of Sandy Ryerson, beyond what we might see on screen. Stephen Tobolowsky: Any role I work on can be framed by two main questions: What is my character’s greatest hope and what is his greatest fear. All behavior is to some degree influenced by these two things. For Sandy, his greatest hope was encapsulated in a line he had in the “Acafellas” episode: “This is my shot of getting back to the world of the normal.” The line was cut in editing but the truth remains – Sandy is pained by feeling like he lives in the outskirts of acceptability. It is a lonely place…or as he says in “Preggers”: “I’m living a cocoon of horror!” So loneliness and being ostracized is what Sandy fears most. Will we be seeing more of Sandy in the second half of season 1? Have you heard any word on any potential storylines Sandy might play a part in? We sure hope that we haven’t seen the end of him! I have heard that I am coming back but I don’t know the circumstances or the story lines. These things always change so I have my fingers crossed. I love the show and Sandy so I hope there is more outrageousness to come! If Sandy were to sing a song to express his emotions, what would he sing? How about “Stoned in Love with You” (by the Stylistics) sung to Josh Groban or “Put on a Happy Face” (from the musical Bye Bye Birdie) sung with Sue! FOX recently announced that they will be holding an open casting call for three new characters in the second season of Glee. What do you think of this method of finding new blood for the show, and do you have any advice for hopeful fans wishing to be the newest students of McKinley High? I think it is very clever. It will get a lot of attention and press. I think newbies better be able to sing with the best in the world, dance, be tireless, and have a good attitude about it – other than that – it’s a piece of cake. Thanks again for chatting with us, Stephen! We sincerely hope to see you on Glee again soon!